According to a research, 58 million Americans enroll themselves in Gym or Fitness club. Signing up for a gym membership is always exciting but continuing it for a long-term is difficult. Fitness and health clubs face the huge challenge of gaining members and retaining customers hence, they look for the ways to reduce churn rate, retain more members and enhance the in-gym experience. To solve this issue, what if, they use Beacon technology??? Think of the world where gym knows you are coming and welcomes you with the message of new fitness regime or Think of the world where you finish your fitness training and instantly you receive a message of 50% off on certain flavor smoothie. By implementing beacon technology in Fitness Centre, club operators can provide an automated and personalized experience which encourages the customers to keep coming back and enhance the gym experience. When the members enter the gym, Gym can send a personalized welcome message through beacon based gym app along with the today’s schedule from the past data, workout plans and much more. For instance, beacons can send push notification prompting them to do 7 back and abs workout or dumbbell front squat and much more based on the past work out or if a member has requested for a yoga classes in the past, the beacon can alert them to enroll for the free session of the yoga classes. Isn’t it great if the members can walk-in through your fitness club without doing a manual entry in the register or unlocking door without fingerprints? If beacons are deployed at the entrance of the gym, members can automatically check-in/ check-out the club. With the help of beacon app, the member’s in/out time and the time spent in the gym can be automatically recorded. 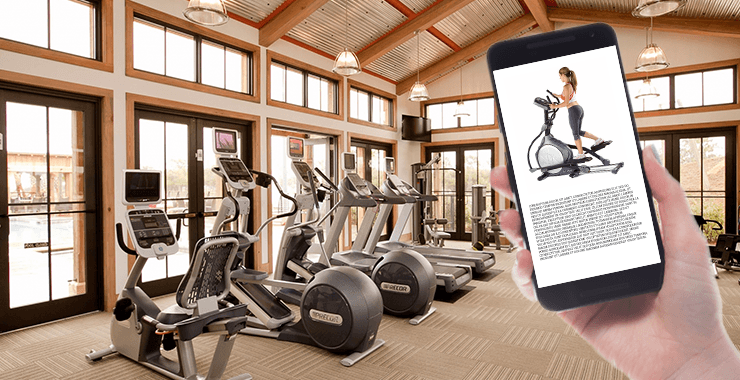 With the help of beacon technology, gym trainer can locate the equipment that are unoccupied and can even know the dwell time of each member on each machine. This data can be used to send personalized messages to the members with their workout plans and the time they need to spend on each machine based on the past workouts. And if the particular equipment is not available, beacons can even send the message to opt for another machine for the time being. Furthermore, when a member is in proximity of certain equipments, they can receive a notification through beacon-based fitness app stating instructions on how to use it. When the members are in the proximity of the gym, Gym can send alerts with the offers like “20% off on aerobics session today from 4:00 pm to 5:00 pm”. This encourages the members to avail the offers and can also be made aware of the various offers running in-gym which can influence their buying decisions. Through beacons, the gym can even send membership renewal discount coupon for the loyal customers. By introducing special offers for the loyal customers, fitness club can ensure customer retention and also ensures the success of loyalty program. Beacon technology reduces the need of personal trainers, thus helping gyms and fitness centers to provide automated and virtual training programs. With the help of beacon technology in Fitness Centre, trainers can track the customer routines and frequency of their visits and based on that, it can send notification that is tailored as per the fitness level. By adopting beacon technology in fitness centre, the gym authority can analyze the data of every member and can improve their gym experience accordingly. The data collected through beacon help them in identifying the busiest hours in a day, which session had more members, which equipment was used the most and which was overlooked, who claimed for the offers and much more. This helps the gym owners to plan the things well in advance, re-target members with attractive offers, improve their efficiency and offer gym services in a better way. Fitness clubs which are gigantic and covers a massive acre of space are generally equipped with thousands of machines and features various attractions like yoga studios, boxing rings, cycling rooms, advance Zumba workouts, juice counters, calorie-free diet café and much more. In such kind of health clubs, members often get lost or need assistance from the staff. By implementing beacon technology in fitness centre, beacon based app can help members in way-finding and indoor navigation and with the help of indoor map. By sending location-based notification to the right people at right time, beacon can track gym member’s journey which further enhances engagement and results in the increased ROI for the owners. Fitness clubs can be digitally transformed by integrating mobile technologies with Bluetooth low energy beacons. As you can see, the possibilities are endless; we at BLE Mobile Apps would take this opportunity to help your gym or fitness club to drive more in-gym sales. Looking to implement beacon technology in Fitness Centre or Gym? Talk to our experts today!